So, if you are a true fan of The Simpsons, you may have heard the news that the show is officially in high definition! I was watching the intro on Youtube and spotted something pretty interesting. 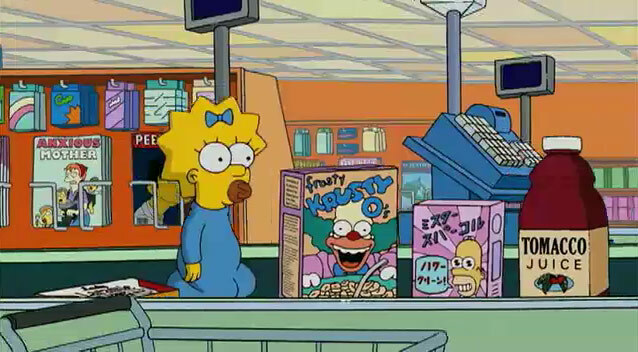 During the part where Maggie gets scanned by the grocery store checkout clerk, Homer is featured as the mascot of a Japanese box of cereal. I went back and found a video of the old intro, and the box of cereal wasn’t there. Gotta love when Japanese pop culture gets sneaked into mainstream like that. Here’s the full 2 minute Simpson’s HD intro. *Update* AndrewGK offers a bit of an explanation behind the Homer box. It’s a reference to and old episode no.175 In Marge We Trust, where the box was first shown. It’s actually a dishwasher detergent knows as “Mr. Sparkle” that Homer originally found at a dump. According to Wikipedia the Japanese writing on the box states that Mr. Sparkle “is a magnet for foodstuffs he will banish food particles to the land of wind and ghosts”. Homer later on contacts the manufacturer in Hokkaido for more info about the product.